Hanoi (VNA) – Vietnam wants to enhance cooperation with Germany, hoping the European nation will provide support in developing small- and medium-sized enterprises (SMEs), digital technology, and boosting startup development and innovation, Prime Minister Nguyen Xuan Phuc told visiting German Minister for Economic Affairs and Energy Peter Altmaier. 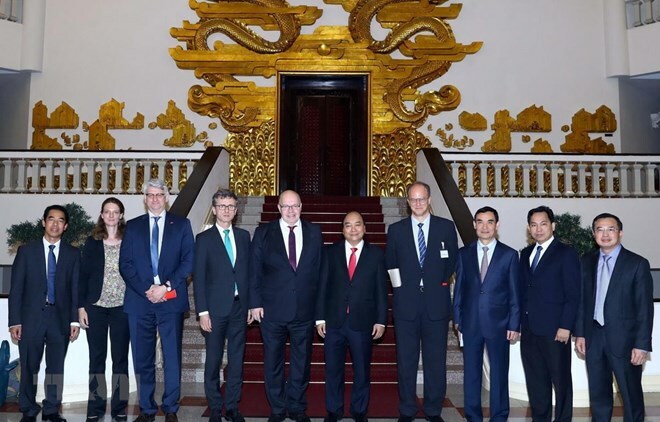 During a reception for Altmaier in Hanoi on March 25, PM Phuc suggested that the German side strengthen investment cooperation with Vietnam, especially in infrastructure and energy development projects, as well as university-level education. The two sides need to focus on measures to promote the two-way trade turnover on the basis of their potential, he said, adding that Vietnam hopes Germany will officially sign and adopt the European Union-Vietnam Free Trade Agreement (EVFTA). He thanked the German government’s willingness to strengthen cooperation with Vietnam, while appreciating the cooperation between German states and Vietnamese localities alongside the European country’s loosening of legal conditions for receiving Vietnamese labourers to work in Germany. Altmaier, for his part, highlighted the potential for the two countries to expand their cooperation, adding that Germany wishes to enhance its friendship with Vietnam. He hoped the two sides will continue to work closely in order to speed up the progress of the Metro No.2 project in Ho Chi Minh City. Germany wants to develop artificial intelligence, digitalisation, and startups in Vietnam, he said, affirming that his country is willing to invite Vietnamese firms to join Germany’s SME renovation programme. Altmaier stressed that his country is ready to cooperate with Vietnam in renewable energy development and education and training. In his response, PM Phuc said the Vietnamese government is making every effort to accelerate the construction of Metro No.2, adding that the country is also promoting technology development amid the Fourth Industrial Revolution. He said that Germany’s ODA-funded projects have made important contributions to Vietnam’s socio-economic development, expressing his hope that the German government will continue to provide ODA capital for Vietnam in the process. The Vietnamese leader said Altmaier’s visit to Vietnam is an important event towards enhancing the relations between the two countries.